This excerpt from my dissertation is the conversion-story summary of Respondent Two, a female from Bethlehem. Feel free to interact in the comments or download my dissertation as a free PDF here. Dunning, CA (2014) Palestinian Muslims converting to Christianity: effective evangelistic methods in the West Bank. Pretoria, South Africa: University of Pretoria, PhD thesis, pp. 301-304. Respondent Two was born and raised in Jordan, a Palestinian in exile. Her father was a teacher who encouraged his children to read, especially in English. This emphasis on reading gave her the opportunity to think and explore things outside of Islam and to question her family’s religion. During her childhood years, her father’s answer to any questions that were raised about Islam was always, “don’t question Islam, just accept it.” This answer did not satisfy her, so she continued to read and think independently. When the respondent reached high school, she began to notice what she described as “contradictions, logical tensions, and other problems,” in the Qur’an. However, she was always reminded that she should never “question Islam, just accept it” and that she should “believe in Allah, Muhammad, the Qur’an, and angels.” The more she read, the more she noticed what she thought were problems in Islam and contradictions in the Qur’an. One specific issue she found objectionable was that “Allah can’t forgive one mistake.” She also mentioned that her mind would wander during prayer and that she started to think that Islam might not be true. While studying in college she became friends with a Christian, which not only was a new experience for her it provided a new way of thinking about religion in general, and Christians specifically, even though her new Christian friend never suggested that she should become a Christian. It was at that time that her initial set of dreams occurred, but it would be almost ten years before she understood their meaning. In the first dream of this set, all the stars in the sky came together in a single bright mass before falling one by one to the ground beside her. Having no idea what the dream meant, she asked trusted friends and family members who either laughed at her or said they could not interpret the dream. She wondered if the stars represented jinns – evil spirits. The last dream in this series of dreams was once again of all the stars in the sky coming together, but this time, they gathered together in the shape of a Christian cross. Like the previous dreams, she had no idea of the meaning of this dream, but this time she was too afraid to ask anyone for help. About six years later, the respondent received an emotionally crushing blow when her six-months old son died suddenly. Many of the questions she had about her son’s fate were answered in a set of dreams. In the first dream she saw a white dove that told her that her son was okay. This was both understandable and comforting to her. However, in the second dream, “a man dressed in white with a face of light” appeared and said in Arabic, “come to me,” which did not make any sense to her at the time. During this episode of increased prayer and uncertainty, a family friend began to regularly visit the respondent and her husband. The focus of his visits was to talk with the couple about Jesus. It did not matter if they wanted to talk about Jesus or not, the visitor always seemed to get the conversation turned in that direction. This friend would regularly point out problems within Islam as well as testify of how his life was being blessed by Jesus. Within a couple visits the friend gave the respondent and her husband a Bible, which she began to read immediately. Over the course of about twelve months, the respondent “read the New Testament five or six times and the Old Testament three or four times,” and she sensed her thoughts about Christianity becoming more positive. However, even though she was starting to gain a level of acceptance about Christianity and the possibility of becoming a Christian, the deity of Jesus remained a major barrier. She simply could not embrace the idea that God could come to earth in human flesh. The family friend introduced the respondent to a pastor in Jerusalem who interpreted her first dreams. He told her that, “the stars falling from the sky to the ground represented [her] leaving Jordan and arriving in Palestine, and that the stars in the shape of the cross represented [her] believing in Jesus.” This interpretation made some sense to her since she had come from Jordan to Palestine. The second portion was also reasonable, to a point. She could believe in Jesus as a man. However, she still could not accept Jesus as God. This internal tension lasted another six months, but she continued to read the New Testament in large quantities. The more she read, the more she loved Jesus, the man and the prophet. However, the more she read, the more clear it was to her that “the New Testament presents Jesus as more than a man and more than a prophet. It presents Jesus as God, too.” “Obviously that’s one of the parts of the New Testament that Muslims believe was corrupted,” she offered as an apologetic against what she was coming to understand at that time. Her husband had lost interest in their friend’s regular discussions about Jesus and Islam within the first three months, but she had not. In fact, she had become more interested, but she had to be cautious in order to avoid upsetting her husband, who eventually suspected she had become a believer and sent her to her father to be sorted out. Since she had not yet believed, her father could not get a confession from her, and with a stern warning sent her back to her husband. Immediately upon her arrival, the respondent’s husband warned her that if she ever became a Christian he would divorce her and send her back to her father, who would certainly kill her for the family’s honor. Fearing for her safety, she replaced the Arabic Bible that she carried in her purse with an English one since her husband could not read English. She also began listening to the New Testament on an mp3 player, which gave her safer and easier access to the New Testament while riding the bus or cleaning the house. Themes that emerged in this interview: Personal Bible reading, doubts about Islam/Qur’an, dreams, a crisis, uncertainty, and common objections to the gospel. Download my dissertation as a free PDF here. 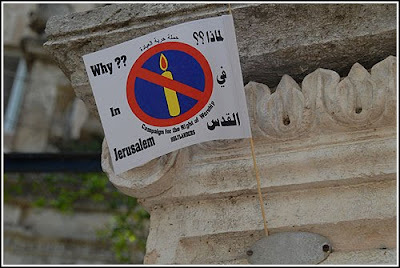 The Jerusalem Post is reporting that the Baptist House in Jerusalem has been vandalized again. The story offers a good historical recap of the various acts of vandalism that have happened there over the years, including the arson that led to the rebuilt sanctuary that appears in the accompanying photo. For those that don’t/can’t read Hebrew, the graffiti says, ” Jesus the son of a whore. Price tag. We will crucify you.” The article explains a bit about the first two phrases, but totally disregards the latter. I’ll add a few more thoughts about these phrases. 1. Israelis commonly refer to Jesus as Yeshu, rather than Yeshua. Because this usage/identification is so common, many Israelis honestly believe his name to be Yeshu, which is an acronym for “May his name and memory be erased.” Some counter that the acronym explanation is simply a Christian attempt to gain sympathy. If that’s the case, what’s the explanation for the use of Yeshu, rather than the common Hebrew name Yeshua? 2. 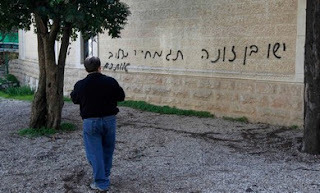 “Price tag” is the call phrase for a group of West Bank Jews who are vandalizing mosques and other buildings in a similar (or sometimes more severe) way. 3. The JPost completely disregards the phrase, “We will crucify you.” That coupled with “price tag” might be intimidating for those who are left to wonder who did this, and whether it may have future implications. Because the perpetrators are unknown, those questions remain unanswered. I wonder why the JPost didn’t mention the most threatening graffiti? Update: The JPost did mention this phrase in a previous article. Many Christians from around the world were expected to flood the city for Good Friday, and they did. 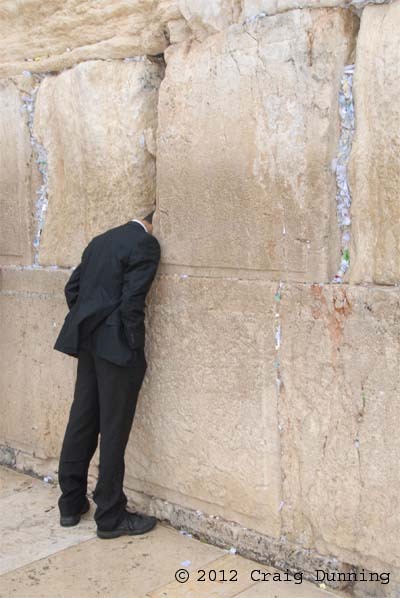 In fact, since Passover and Eastern and Western Easter falls on the same weekend this year, the city seemed particularly crowded. In expectation of the large crowds the Israeli government implemented new access procedures at the Church of the Holy Sepulchre, which created a lot of tensions. 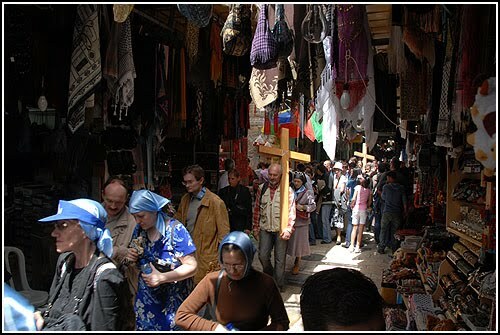 Flags like the one below could be seen throughout the Christian Quarter. The flag is aimed at the Israeli authority’s efforts to control the crowds, which at times ended up communicating to those wanting to be near or inside the church that they were not allowed to worship. Obviously, once the new arrangements were announced, someone(s) went into action to highlight the Israeli actions and paint them as negatively as possible. However, being in the area today, I must admit, one could easily get a very negative impression without the presence of the flags. I was told that things escalated to the point of blows being exchanged. I did not see that, but I have no reason to doubt it. 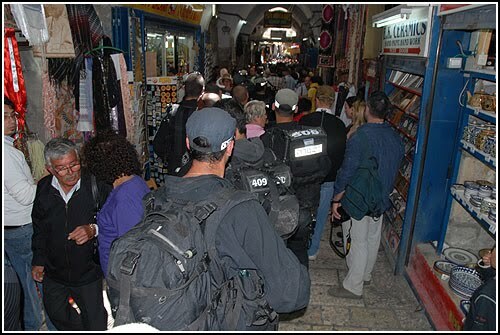 It seems to me that the Israelis are in a no win situation here: If they don’t control the crowds, there is a real possibility of a stampede or worse, and they will be accused of shirking their responsibility for public safety. 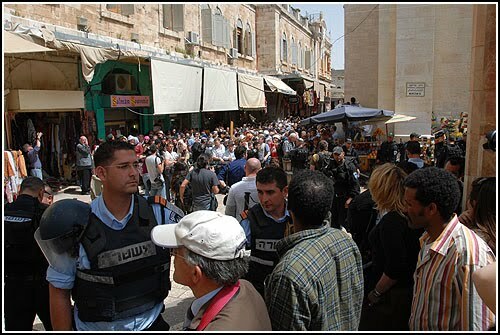 If they do control the crowds, they are accused of preventing pilgrims from worshiping. History indicates that during times like these, the various Christian groups that have authority within the church facility can’t manage to get along without violence, so I’m not sure what I would advise them to do. 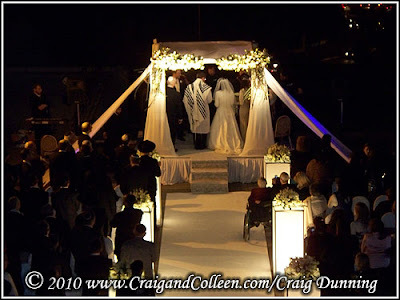 While waiting for someone at a hotel in Jerusalem, I happened upon this beautiful wedding. In the end, I was at the wrong hotel because the person I was waiting for had been moved to another hotel without his knowledge. Seeing this wedding eased the sting of being at the wrong place for a couple of hours.